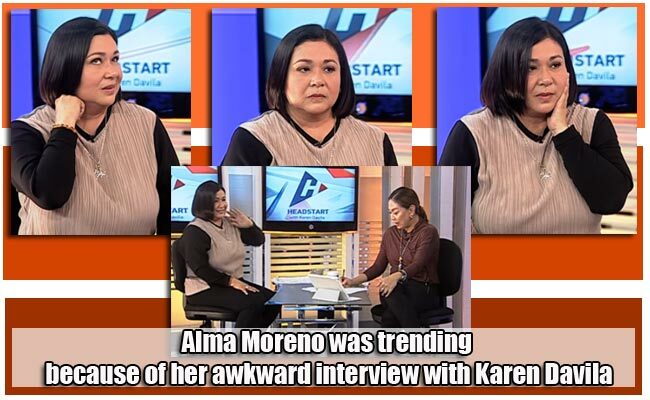 Sunday evening, United Nationalist Alliance Senatorial candidate Alma Moreno was trending on Twitter because of her controversial 'awkward' interview with Karen Davila on the latter's TV show, ANC's Headstart, which was conducted earlier this month. Moreno did not need any TV advertisements or campaign propaganda to introduce herself as one of the aspiring senatorial candidates to the public because her interview made its round online. Interviewed by Davila, Moreno was asked about her advocacies and platforms as a senatorial candidate. However, it seemed to be that the actress-turned-politician was not oriented about the questions to be thrown at her, prior the interview, because she looked like unprepared as she stumbled answering Davila's smart questions. Despite Karen Davila's obvious attempts to help out her guest, the interview still went awkward at the 9:44 mark of the 23-minute video clip. The awkwardness started when the journalist asked Alma Morena, why is she running for a senatorial position and why not start as a Congresswoman or any lower position. Moreno answered that she did not really plan to run for the said position. She just prayed for it (Moreno: Hindi ko pinlano tumakbo for senator. Dasal lang talaga. ), a little bit off-the-topic. Karen Davila clarified with Moreno why is she qualified to the position and Moreno answered that it was because of her experience as a 'LEGISLATION'. Moreno even boasted that she was a Councilor for 9 years and a First lady for 9 years prior to that. It became more awkward when the host asked Moreno about her advocacy and Moreno answered, "Magna Carta of women", Karen Davila rebutted that the law already exists. But the Senatorial aspirant answered, "No, may mga hindi nai-implement..." "Like what?" Davila asked again which silenced the confused candidate. The female host questioned Moreno if she was for RH Law and the latter answered that she was. Karen Davila even clarified if Moreno was saying "Yes in all forms or Yes with reservations?" Alma Moreno answered that she agreed with the law but with reservations. However, when Davila asked what these reservations are, Moreno replied with, "Kailangan pa bang sagutin? ", which Davila countered with, "Of course, you are running for the senate." Karen Davila asked once more, "What are your reservations?" Alma answered, "DISSEMINATE!" Karen expounded her own question, trying to help out the actress-politician, "Ang sabi mo kasi, 'para ako sa RH Law with reservations', ang tanong ko ano ang mga hindi mo gusto sa RH Law?" Moreno seemed to be confused and said, "Teka nawawala ako. 'Di pa kasi ako napupunta doon. PILLS!" Davila professionally segued another question instead and asked Moreno if the government needs to buy contraceptives for baranggays, then. Facebook user Marjorie Claire Enclona stated, "I feel so bad for her during the whole interview. I'm sure she's a good person, very kind. Pero kulang pa talaga ang knowledge nya to run for the senate. Mas mukha pang running for senate si Karen Davila sa kanya eh. Haha" regarding the video clip of the interview, posted in Pinoy How - Filipino Q&A Blog page. While, according to one Twitter user, @yunii_01, first-time voters should be vigilant to whom they will be giving their votes to, tweeted that "This Alma Moreno trend is really an eye opener to those newly registered voters! Cliche as it may be, but seriously, VOTE WISELY!" Funny memes were posted regarding this hilarious interview.